A manager who uses to sit at the zenith position of a department or a wing of a business organisation has to maintain certain Report Writing responsibilities based on the specific demands of the organisation. In order to maintain a free flowing process of operation in his/her own department, a managers needs to plan, organize, direct, monitor and evaluate various organizational process and activities (Mullins, 2010). This Report Writing try to describe job responsibilities as the store manager of ASDA, one of the largest retailers of UK and my relationship with and interdependency on the other important person or group of individuals attached to the store. In ASDA, I have the responsibility of handling the Beeston Supermarket of the company and properly guiding my subordinates to help them achieve specific organizational objective. This Report Writing tries to describe as a store manager of ASDA, I have the responsibility to plan specific strategies, the implementation of which will bring success for the specific supermarket. The strategies related to sales, promotion, human resource management and corporate social responsibility are necessary to formulate in order to earn steady business for the organization (Dale, 2009). The next important responsibility that I have to perform is to implement those planned strategies and for implementation of strategies organizing and allocating various resources of the organization is mandatory. Each and every individual attached with the store needs to have clear and predefined organizational objective in front of him/her. This Report Writing tries to describe As the store manager, I have the responsibility to allocate each and every individual employee of the store specific tasks and objectives and make it sure that everyone has clearly understood their targets. Directing the subordinates is a must to perform duty for a manager (Hall, 2010). As the store manager of ASDA Beeston Supermarket, I have to direct my immediate subordinates to the way in which they can attain success. My job responsibility also includes implementation of a monitoring process on the performance of every employee working in the store. Based on the outcome of the monitoring process, I have to evaluate the performance of my subordinates and offer them specific reward on the fulfilment of their individual responsibility. During my engagement as the store manager of ASDA Beeston Supermarket, I use to give support from some of my important subordinates who render effective cooperation and fruitful results which are needed to attain specific business target. If a list can be made of those important subordinates, the list will surely carry the names of Mr. George Brown, Ms. Lim Yung, Mr. Ashton Bell, Mrs. Mary Ann and Mr. Jeffery Lewis. These individuals hold certain very important designations in the shop. My performance as the shop manager relies largely on the individual performance of those above said subordinates. They use to perform effective organizational responsibilities and handle their subordinates in such an efficient way that achieving organizational objective seems to feel like a cakewalk to me. They respectively hold the position of assistant sales manager, supply chain executive, finance officer, marketing and public relation executive and human resource executive. This Report Writing tries to describe the list of my important subordinates mentions the name of Mr. George Brown, who holds the designation of the Assistant Manager. He is a 44 years old management professional from Yorkshire who has completed his management study from Aston University. He is a soft-spoken but determined individual with whom my interaction always includes business strategies, customer preference and so on. The next to mention personality is Ms. Lim Yung, a 26 years old lady from Japan. She uses to hold the position of supply chain executive. She is a promising graduate of the University of Bath and an aspiring management trainee. She is extrovert and result oriented. My professional interaction with her includes discussions on the available sources of supplies in the market. Among the list of my subordinates, the name that should be there is Mr. Ashton Bell. He is an energetic young fellow of 25 years of age and belongs to Birmingham. He is an able finance graduate from University of Birmingham who uses to look after the monetary part of the shop. He is our finance officer. My interaction with him always includes conversation on the cost effective ways in which the shop can be run. He uses to handle the cash inflows and outflows. Another mentionable name in the list of my important subordinates is Mrs. Mary Ann, a 34 years old British lady from London. She holds the position of Marketing and Public Relation executive of the shop. She has done her management studies from London College of Communication. My interaction with her always involves exchange of suggestions regarding the best possible marketing and promotional methods which can create awareness among the local population about the shop and the facilities it offers. As overall marketing strategies are implemented by the marketing professionals of the head office, Mary has the responsibility of conducting local level marketing initiatives and performing corporate social responsibility initiatives as part of her duty to build up public relation with the local people. The list of my important subordinates includes the name of Mr. Jeffery Lewis, a 35 year old HR executive from Leeds itself. He is a proactive management graduate who uses to effectively handle the employees of the shop. He uses to deliver regular feedback to me on the performance of each and individual employee. list of important individuals In this report writing includes the names of those who belong to the internal part of the organization. The list does not contain any name of an individual who is from outside the organization. The reason behind this lies in the fact that I usually don’t get any chance to interact with the individuals from outside the organization like suppliers or customers. It is my subordinates who use to interact with the external sources of the organization and provide feedback to me at regular intervals. There is a network of individuals existed between the different employees of the shop. In ASDA Beeston Supermarket, there is interdependency discernible among the important employees of the shop. This Report Writing tries to describe the store manager, I need to depend on my important subordinates. At the same time, the assistant manager and other departmental executives need to depend on each other for maintaining a successful and steady organizational process. For Example, George, our assistant manager, has the responsibility to maintain an overall look on the organizational process of the shop. He can confirm an effective organizational only with the help of Lim, Mary, Ashton and Lewis, who have the responsibility to handle the supplies of raw materials, marketing initiatives, financial process, and workforce management respectively. In another case, the specific organizational responsibility of Mary, who is in the charge of marketing and CSR activities, needs to rely on Ashton. The specific amount of money that he will allocate for conducting CSR activities would have its impact on the decision of Mary in choosing the most suitable CSR activity which can at the same time be effective for creating awareness about the shop among the local people and will fit into the budget. I find that all the important employees have sequential and reciprocal interdependence between each other. In Sequential interdependence, the production of one unit in the entire organizational process is successfully utilized by the following unit (Baligh, 2009). The concept of reciprocal interdependence brings to the fore the idea that the output of one department of the organization can be used as the potential input of another department. Based on these concepts, it can be seen that the outcome of the finance department that means the financial benefit of the organization depends largely on the outcome of the supply chain department. If Lim, Our supply chain executive, could not be able to find out the most suitable supplier of fresh food products that will supply quality products at a reasonable rate, the shop will never be able to earn profit and accordingly the finance department will also suffer. 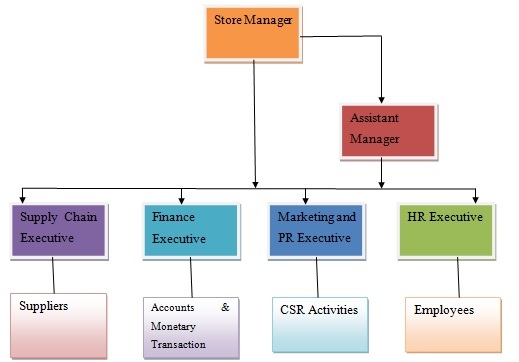 Even the performance of the store manager is dependent on the performance of the human resource executives (Wright, 2009). If Lewis, our HR executive, cannot be able to recruit competent employees who have to deliver efficient and effective service, the shop will never be able to achieve its business target. It will undoubtedly not bring any good news for the store manager also. In order to increase organizational effectiveness and simplify the process of business objective achievement, certain recommendation can be made. In order to increase the individual efficiency of the important employees, regular feedback can be collected from various sources of the organization with the help of 360 degree feedback system (Roberts, 2010). Implementation of information technology in the organizational process makes it less time consuming and hassle free (Brown, 2012). In ASDA Beeston supermarket, I can implement a properly structured information system which will help my important subordinates to access organizational knowledge in an effective way. The role of a manager in a business organization encompasses the responsibility of creating a well defined organizational structure where each and every employee can enjoy a collaborative and cooperative working atmosphere. This will undoubtedly help them to derive job satisfaction.